This Fakra-to-SMB antenna connector adapter allows you to convert your OEM factory-installed XM or Sirius tuner containing a single yellow Fakra antenna jack to an SMB antenna jack. This will allow you to connect any of the modern aftermarket Sirius XM Radio antennas (including truck antennas) to your factory-installed satellite radio tuner. Also Available: Male Fakra (yellow) to Female SMB adapter cable. 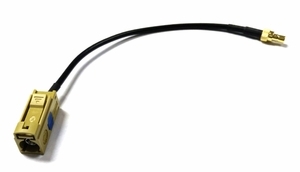 This adapter connects to your factory-installed XM tuner and allows you to connect an aftermarket satellite radio antenna. If you are looking to utilize your factory-installed XM antenna with an aftermarket radio, please use our XM Radio Factory Antenna Adapter.